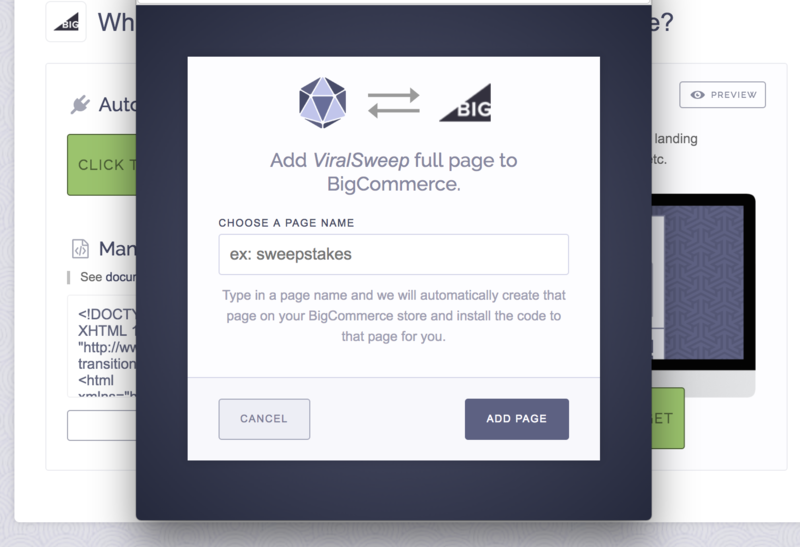 Next, click the Install button on your campaign in ViralSweep. 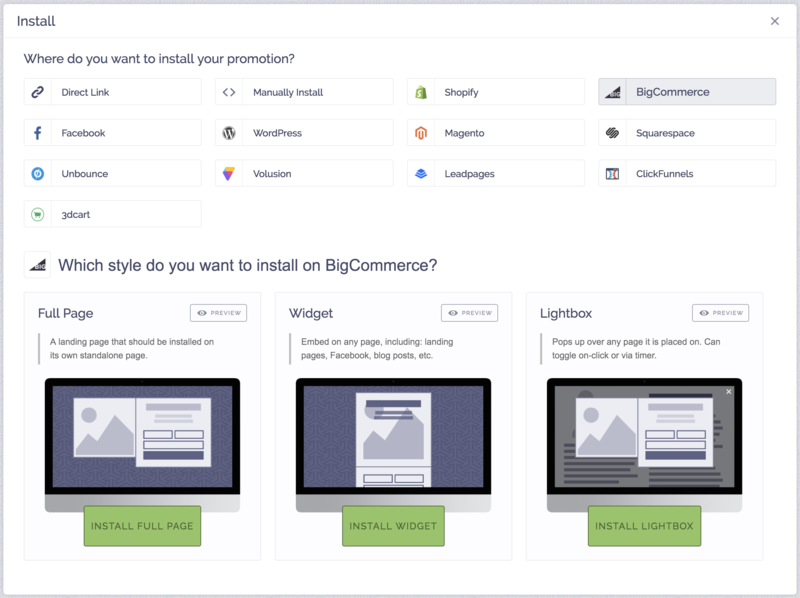 Choose Big Commerce and then click Install Full Page or Install Widget and then choose Auto-Install. A menu will appear. In this menu, simply type in a page name, and we will automatically install the promotion to that page. Please note, we cannot install to an existing page. If a page already exists that you want us to install to, delete it first, then go through the process to automatically install it. If you want to install to an existing landing page that already has content on it, you will need to manually copy the code we provide and paste it into your page. Additionally, we cannot automatically install the lightbox to an existing page. Please use the instructions below to install the lightbox. From within your ViralSweep account click Install on your campaign, then copy the code for the lightbox. Navigate to your BigCommerce dashboard and go to Storefront > Template Files. Find 'default.html' and click edit. Paste in your ViralSweep lightbox code before the closing body tag if there is one, otherwise put it at the end of the file. If you want the lightbox to show up on every page instead of just the homepage, click on the footer file on the left side and add the code there instead. Navigate to your site and you should see the lightbox. Keep in mind, the lightbox functions on cookies, so if you view it once, then close it, it will not display again. If this happens, try viewing your site in a different browser. Still having trouble with installing your campaign to BigCommerce? Simply click the support or live chat icon to get in touch with us.